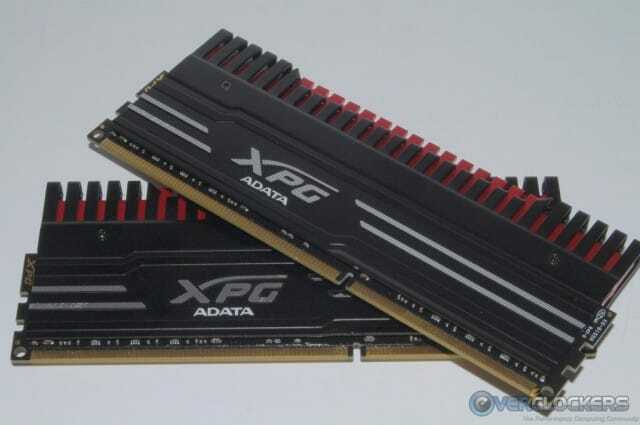 Memory manufacturers continue to push the speed limits of DDR3 memory; and today, we’ll be looking at one such kit in the form of ADATA’s XPG V3 DDR3-2933 MHz kit. This ADATA offering appears to have everything the enthusiast user looks for in a high performance memory kit… and then some. 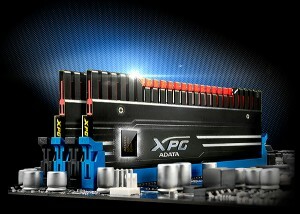 There are a few other unique features the XPG V3 memory kits offer that we’ll explore as well, so let’s get going and see what ADATA has come up with! 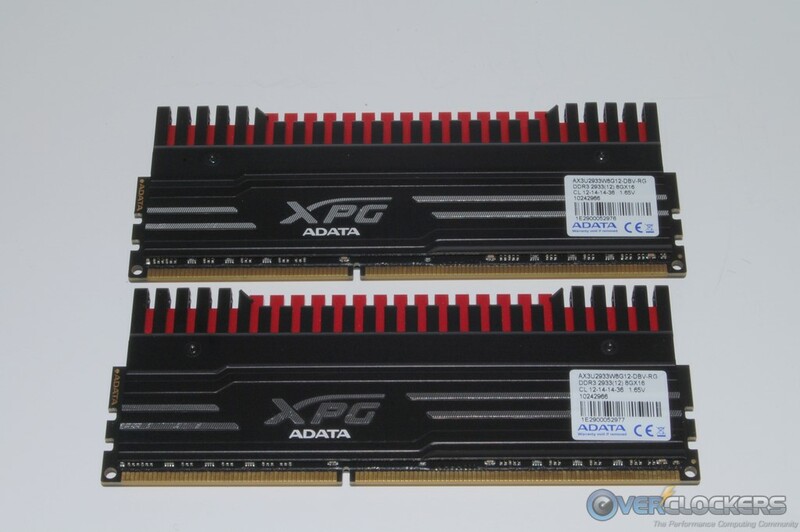 Here are the specifications ADATA provides for the XPG V3 Memory kits. 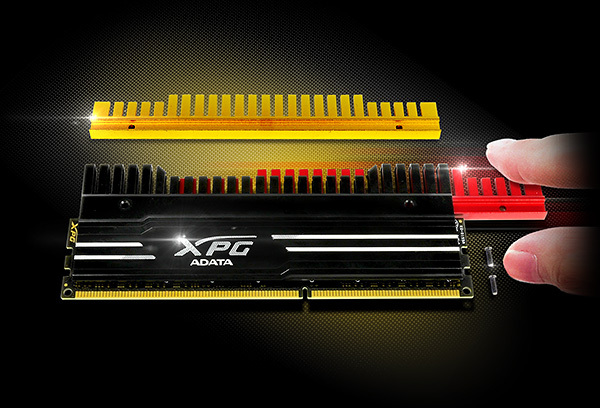 As you can see, the XPG V3 memory kits are available at speeds ranging from DDR3-1600 MHz all the way up to DDR3-3100 MHz. Operating voltage and timings will vary between the different kits. The below table shows all the different kits available in the XPG V3 product line. 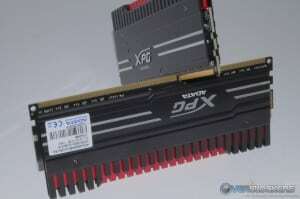 The kit we have for review today is the third one down the list (DDR3-2933 8GB X 2). Obviously, plenty of other options are available to suit just about anyone’s needs. 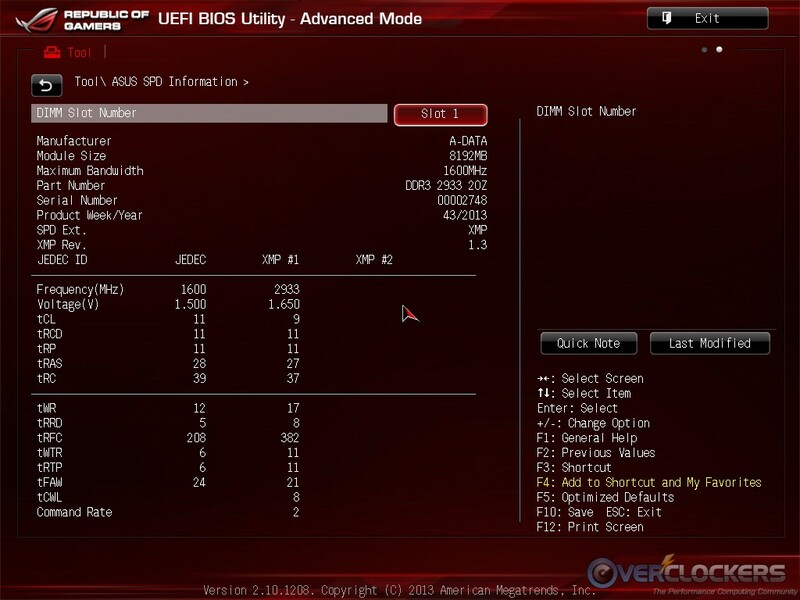 Once the memory is installed in the system, this is how the BIOS and CPU-Z see things. The SPD table in BIOS shows incorrect timings for XMP #1; but when you actually set the memory to use the XMP #1 profile, the correct settings are applied. CPU-Z reads everything correctly once booted into Windows. The ADATA marketing folks have a few highlights they want potential buyers to know about. First is an overview explaining the Thermal Conductive Technology (TCT) including their claims of great cooling, stability, and durability. All images and descriptions below courtesy ADATA. 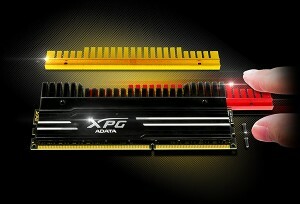 Ready To Fire With XPG – ADATA XPG V3 DDR3 Overclocking DRAM Module applies Thermal Conductive Technology (TCT) with unique detachable fins for the ultimate cooling performance and stability when the system is in full-speed operation. It’s designed as the best solution for gamers and enthusiasts thanks to high stability, compatibility, and durability. ADATA designed heatspreaders that feature interchangeable fins to change colors schemes. The inner red fin stack can be removed and replaced with the included gold colored one if preferred. Durable Memory with a Stylish Detachable Fin – XPG V3 is built for PC enthusiasts and gamers to pursue extreme performance. The eye-catching heat sinks and 8-layer PCBs with 2oz copper provide outstanding cooling performance and stable data transfer. 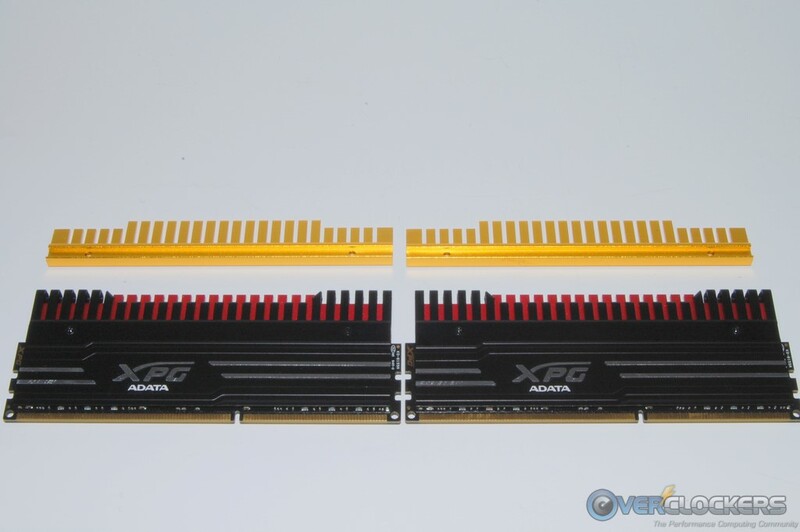 An additional pair of golden fins are included in the package, making the XPG V3 more customizable. The detachable fin can be replaced by removing the screws, allowing users to exchange the fins and match the colors in their rig! The TCT feature insures each memory chip makes contact with the heatspreaders, which ADATA says allows the PCB and ICs to operate at the same temperature. The modules are also made with an 8-layer PCB and a 2 oz copper inner layer. 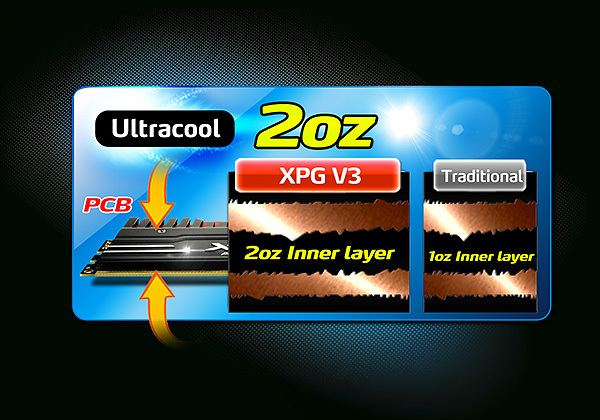 No Crash With Great Stability – XPG V3 DDR3 DRAM Module utilizes the Thermal Conductive Technology (TCT), which makes every chip have contact with the heat sinks directly, ensuring IC and PCB operate in an environment of equal temperature; therefore, XPG V3 is able to maintain the best stability, even in full-speed operation. The unique detachable fins extend the heat sinks upwards for more cooling space and generate improved cooling performance. And the 8-layer PCB with 2oz copper helps to reduce the electric resistance effectively and consume less power, which greatly enhances the integrity of signal transfer. It’s no surprise high quality memory chips have to be used to achieve speeds like this kit offers. ADATA claims a strict binning process is in place to filter the good chips from the bad. 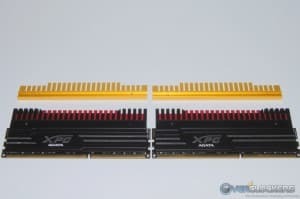 Extra High-Quality Chips – XPG V3 DDR3 DRAM Module is made of high-quality chips selected by a strict filtering process. It also uses top quality PCBs (Printed Circuit Board) that effectively extend the lifespan of memory modules. The ADATA XPG V3 kit we received came packaged in a plastic clam-shell. Inside, the cardboard insert is used for some product branding and instructions on how to swap out the aluminum fins. The spare aluminum fins are found enclosed at the back of the package. 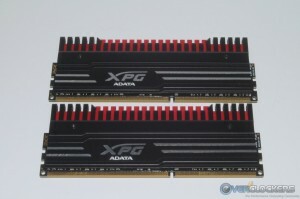 Before we get to the testing phase of the review, here are some pictures of the ADATA XPG V3 DDR3-2933 MHz memory kit. I’m sure most enthusiast users will find the memory to be aesthetically pleasing. The black colored PCB is another nice touch that a lot of users will appreciate. Once we have the memory kit installed, we start the testing with a stability check at advertised speed/timings/voltage. For this task, we use the Ultra-X R.S.T. Premium USB memory tester. What happened to our R.S.T. Pro we’ve been using? The fine folks at Ultra-X were kind enough to upgrade us to their new R.S.T. Premium model! The R.S.T. 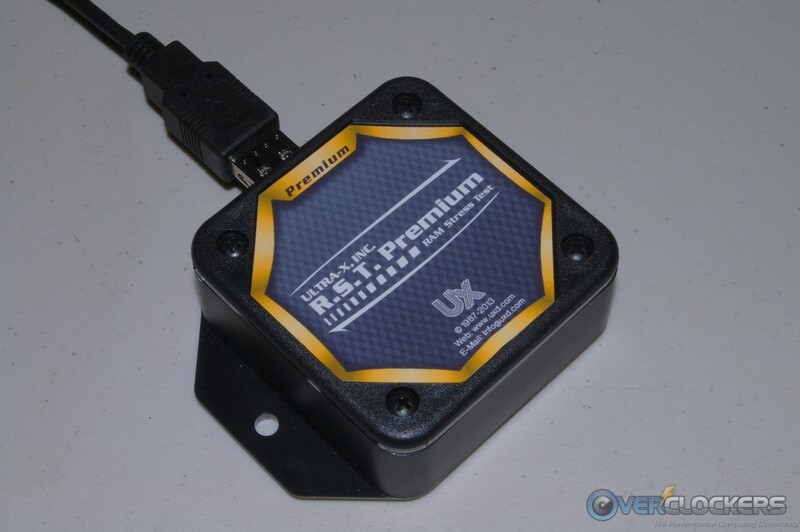 Premium USB memory tester is their newest offering, so it doesn’t yet have its own product page on their website. Here is a picture of this nifty device. Just like all the previous Ultra-X R.S.T. memory testers Overclockers.com has used over the years, this one has no mercy when testing memory. It runs a complex series of tests that takes many hours to complete. The length of time to complete the five passes we like to perform can vary depending on the capacity of the memory kit. In a nutshell, a memory kit that passes this torture test is stable as a rock. In the case of the ADATA XPG V3 DDR3-2933 MHz 2X8 GB kit we’re testing today, it took over seven hours to complete the five passes. The kit passed with no errors, so we’re off to a great start! For stability testing within the Windows environment, we normally use HyperPi set to use all available CPU cores/threads. No problems encountered here either, we’ll call this memory kit stable at advertised settings! Here are the components used in our test bed. We have quite an assortment of kits for comparison today, which range from DDR3 2400 MHz to DDR3 2933 MHz speeds. 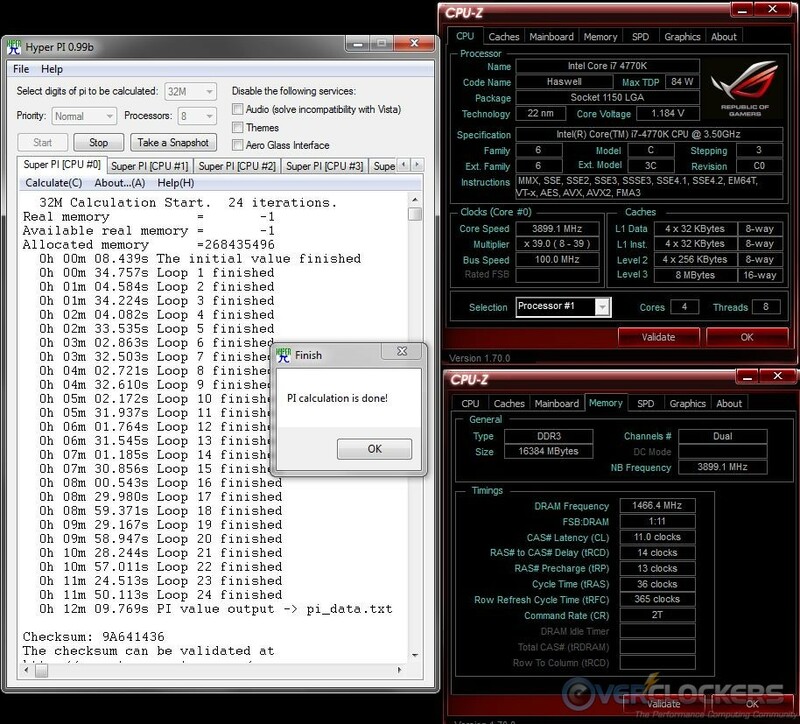 All of the kits were tested at their advertised speed/timings/voltage with the CPU set to its stock setting. 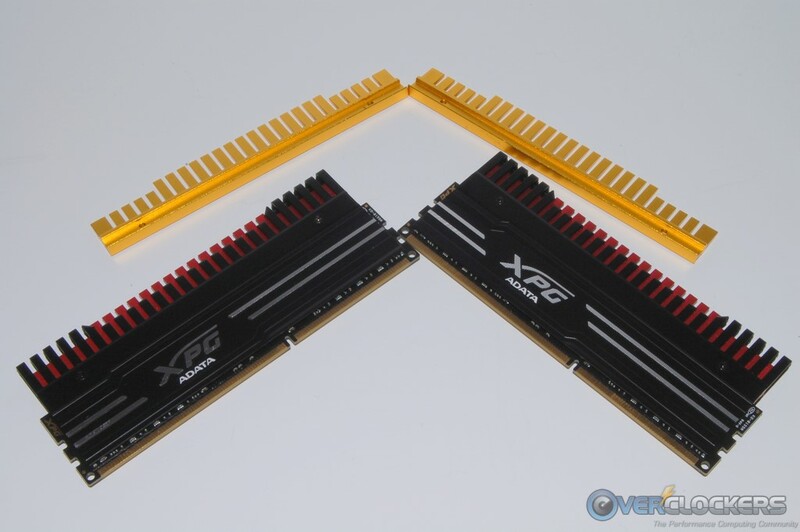 All of the kits were tested on the same system with the exception of the G.Skill TridentX DDR3-2933. That kit was tested on an ASUS Maximus VI Extreme and also used an i7 4770K just as the test system we’re using today. So, even though the systems are a little different, the same CPU and same chipset are in effect here. As I’m sure most of you are aware, many of these higher frequency DDR3 kits use Hynix MFR memory ICs that are known to hit high frequencies. However, this often comes at the expense of overall performance. 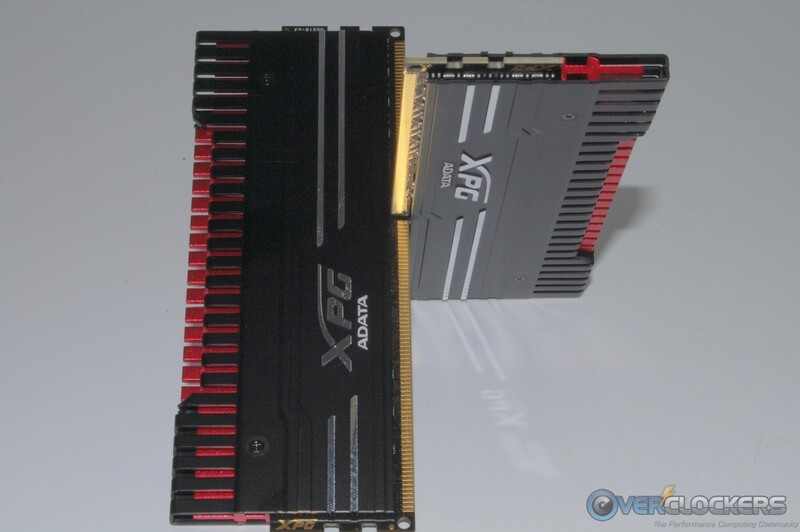 Our comparison samples include a G.Skill DDR3-2933 MHz kit that is a single-sided Hynix MFR based memory kit. 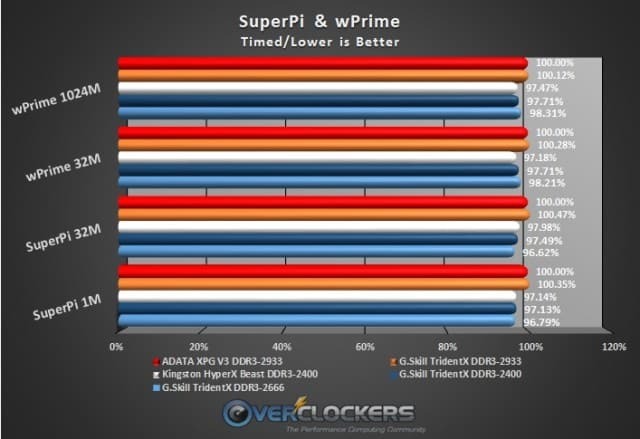 Back when hokiealumnus reviewed that kit, he came away impressed with the overclocking ability; but his testing proved a performance level that simply left a lot to be desired. In the case of today’s review sample, it’s pretty clear the Hynix MFR memory ICs are used based on the speed of the kit and the benchmark results. However, being a 2 X 8 GB kit, it’s double sided… we’ll see if that has an impact on performance (good or bad). 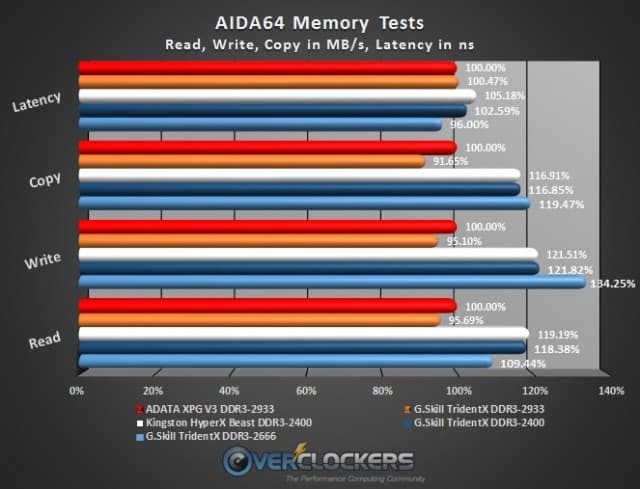 The graphs below are based on percentages with the ADATA kit being the basis, and therefore always being 100%. A higher percentage is better on scored benchmarks, and a lower percentage is better on timed benchmarks. Below each graph is a table with the data used to make it. The AIDA64 suite of memory benchmarks show the ADATA kit besting the G.Skill DDR3 2933 kit in all four tests, but falling substantially behind the other non-Hynix MFR kits. The latency test shows a pretty good result for the ADATA kit, as it only lost out the the G.Skill DDR3-2666 kit (lower is better in this test). 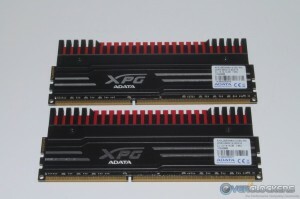 SuprePi and wPrime show the ADATA XPG V3 kit besting the G.Skill equivalent in all four runs; but just as we saw in the AIDA64 memory tests, it fell short of all the non-Hynix AFR kits. These real world tests typically don’t show a whole lot of difference between memory kits like synthetic testing does. Even though all the comparison samples were within a few percentage points of each other in the x264 and PoV Ray tests, the ADATA kit only managed to beat the G.Skill DDR3-2933 in the x264 Pass 1 test. It lost out to all the other kits in all three of these tests. 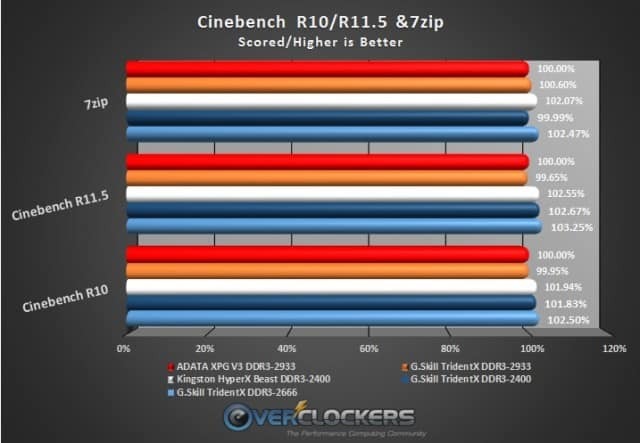 Things didn’t get much better for the ADATA XPG V3 kit in the Cinebench and 7zip testing, but all the results were within a few percentage points of each other again. 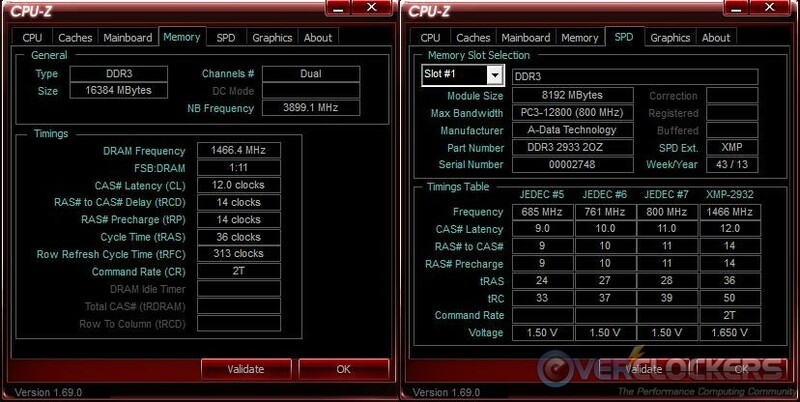 The Cinebench tests show the ADATA kit edging out the G.Skill DDR3-2933 kit, but again losing out to all the non-Hynix MFR kits. The 7zip test shows pretty much a dead heat between the two Hynix MFR kits, and the ADATA kit managed to top the G.Skill DDR3-2400 kit by the smallest of margins here. 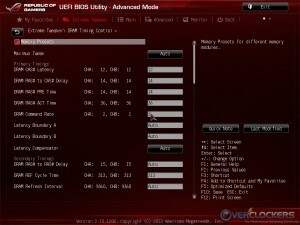 Hynix MFR ICs, slower timings, and high MHz ended up equating to less than jaw dropping performance. Just for a test, I set the ADATA kit to the same speed and timings as a couple of the non-Hynix MFR kits in the sample list. It made little difference in the results and in some cases actually performed even worse in comparison. 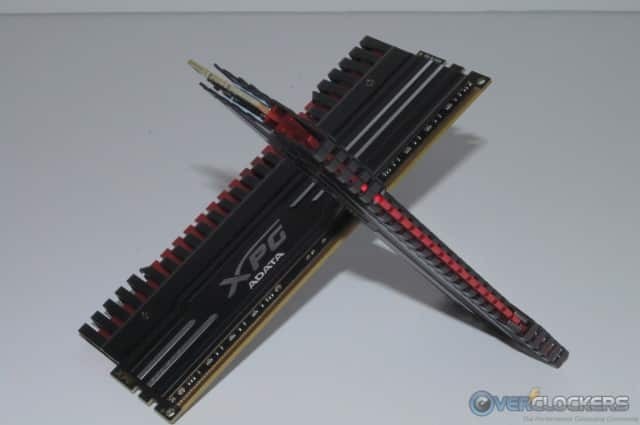 In ADATA’s defense, they do market this kit as “Overclocking” memory with very little being mentioned in regards to performance. 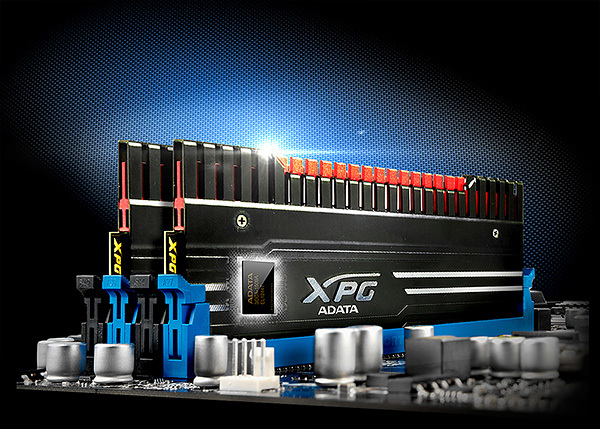 Ok, so far we’ve learned the ADATA XPG V3 DDR3-2933 MHz memory kit isn’t going to set the world on fire with its out-of-box performance. Overclocking the kit anything past its stock speed of 2933 MHz proved unsuccessful. 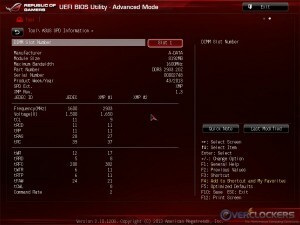 I tried a small overclock to just 3000 MHz, but the system simply would not boot at that setting. I tried up to 1.80 V, loosening the timings, etc., etc. I can’t blame this solely on the memory though as it’s quite possible the IMC on the i7 4770K CPU I have just can’t handle that speed. I was able to get the timings tightened up a little, but not very much. The best I could do here is 11-14-13-36-2T, and even that took 1.8 V to pass HyperPi 32M. I tried a 1T command rate, but the kit (or CPU) was having no part of that. Here are screenshots of SuperPi 1m and HyperPi32M completed benchmarks. Even with the tighter timings, it took longer to complete both of these runs when the memory was set to its stock configuration. Both of these benchmarks were negatively impacted by tighter timings. Strange. 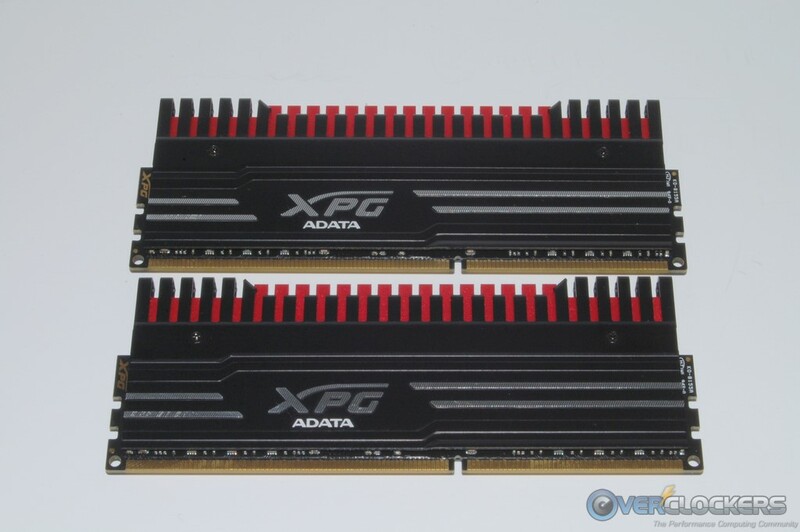 Pricing for the ADATA XPG V3 DDR3-2933 2X8 GB kit hasn’t been firmed up as of yet, but competitor 16 GB offerings push the $700 mark if that’s any indication. When you compare that to 16 GB DDR3-2400 kits at $200 or less, you get equal or better performance for roughly a third of the cost. That’s very tough to justify. It’s not just ADATA throwing these eye catching high MHz kits on the market, all the big hitters are doing the same thing. Sadly, if you do a little research, you’ll find they all suffer from the same price vs. performance issue we’re seeing here. We’re certainly not the first review site to complain about this. On the plus side, the ADATA XPG V3 DDR3-2933 2X8 GB kit proved to be completely stable at its advertised settings, and it did outperform the the G.Skill TridentX DDR3-2933 kit in almost all of the benchmarks results. So, at least an apples to apples comparison shows the ADATA kit performing pretty well against a competitor offering. The replaceable aluminum fins are a nice addition, and the ADATA XPG V3 memory is one of the best looking kits I’ve come across lately. 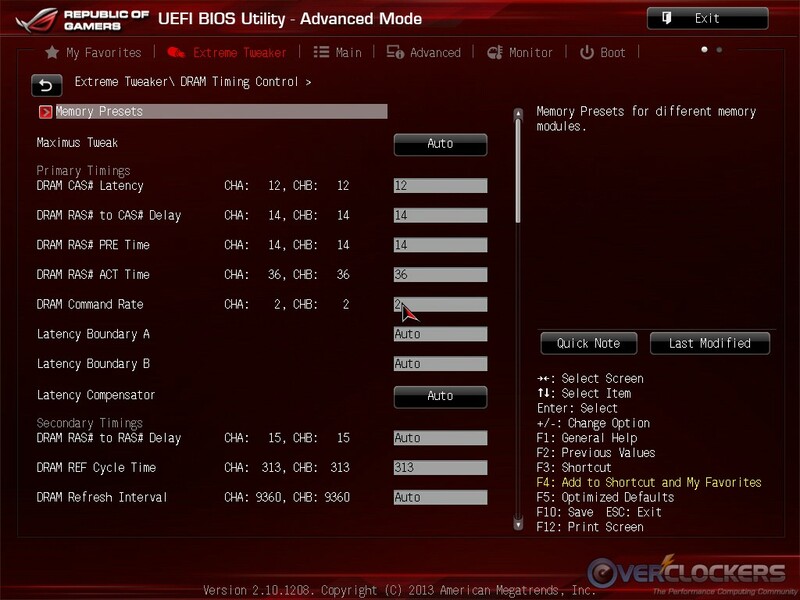 Overclocking was a mixed bag as we weren’t able to push the speed past its stock 2933 MHz, but we suspect that had more to do with the processor’s IMC than the memory itself. We were able to tighten up the timings a little, but didn’t benefit from any performance gains by doing so. In the end, because the kit runs as advertised and topped the competing G.Skill DDR3-2933 kit in almost all the benchmarks, it doesn’t really deserve the “Meh” rating. However, until ADATA figures out a way to get the performance of their Hynix MFR kits up to a level their speed and price suggest they should be, it doesn’t deserve our Approved rating either. So, regardless of manufacturer, your money is probably better spent on a DDR3-2400/2666 MHz kit that will save you a lot of cash and likely perform better than anyone’s Hynix MFR offering. Hynix MFR is not slow especially in 2x8GB but presented results in AIDA64 are low as for 2x4GB kits what clearly shows that XMP profile is really bad. I had better results on ADATA 2x8GB 2600 CL11-13-13 which was also on MFR ( review on Overclockers ). I was waiting for the same kit but ADATA decided to send it to someone else in EU.